New cycle pub brings the bar to the streets of downtown Memphis. As a general rule, drinking and cycling at the same time is probably a bad idea — unless someone else is doing the steering. 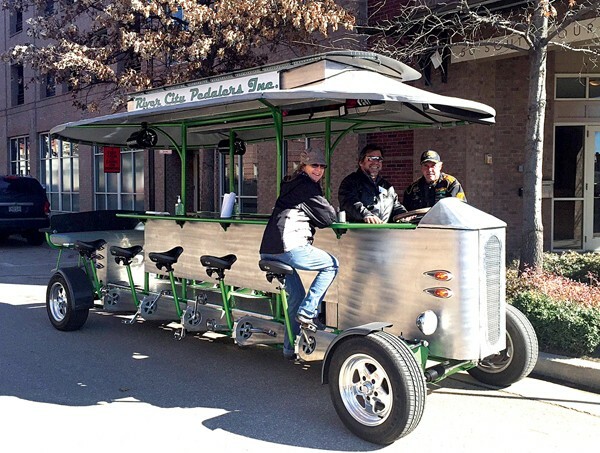 That's the case with the new River City Pedalers party bike, a mobile bar that's propelled through the streets of downtown by pedal power. Patrons do the pedaling (and the boozing) while co-owner and licensed party bike operator Russell Young does the steering. "We saw [Nashville's party bike], and thought, 'Ding, ding, ding! Memphis needs that'," said co-owner Carolyn Young. "We've been working on getting this launched here for almost two years, but we didn't tell a soul, just in case it didn't work out." But luckily for the husband-and-wife team, it did. 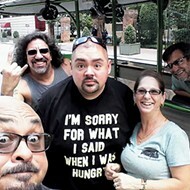 They purchased a 10-seater party bike from a manufacturer in Arizona, and Russell took the training course to learn how to operate it. They were open for business on December 31st. For now, the bar is BYOB because current ordinances don't allow for serving alcohol on a mobile unit. But there's a cooler on board, and the Youngs are happy to stock it with whatever their customers bring to drink. "Beer has to be in a cup, and we allow stops for people to get off and grab a drink. We can't serve your beer because we're not allowed to, but one of your people can serve," Carolyn said. Although they'll occasionally pick up random riders around Beale during slow times, they prefer bookings of eight to 10 people — tour groups, bridal parties, birthday parties, or just groups of friends looking for a fun, new way to tour the city. Here's how it works: Riders sit on each side of the bar, and each bar stool has a set of pedals. The riders provide most of the power to make the bike go, but there is an electric motor that Russell can activate to accelerate uphill. "I tell everybody that you're working off that beer," Carolyn said. The bike tops out at a speed of about 7.5 miles per hour, and just like with downtown's horse carriages, it can only be operated on streets with at least two lanes. On Riverside Drive, the bike is allowed to travel in the new bicycle lane. They operate all around downtown from the Pyramid in the north to the Memphis Farmers Market in the south. Before launching River City Pedalers, the Youngs had been looking for a way to add a little more excitement to their careers. Carolyn previously cleaned houses for a living, and Russell still operates a construction company. "For years, we've been trying to find something for us to do after our 50s, and we're really into the whole entertaining thing," Carolyn said. The party bike seemed like the perfect fit. And since its launch on New Year's Eve, the bike has been a hit downtown. This past Saturday, when the weather was just above 50 degrees, they had three party bookings. And they've already got groups booked for Memphis in May weekend. Currently, patrons pay $20 per person to ride, but when the weather warms up, they'll begin charging $24 a head. Although there are only 10 bar stools, the bike can hold l4 people since there's a non-pedaling bench on the back of the bike. To book a tour, call 825-7519. A website is in the works, but for now, River City Pedalers can be found on Facebook.